Today the download of the SuperGamer 2 GNU/Linux DVD ISO image via µTorrent finally finished. But how to burn this DVD image using Nero Express? It took some time to find the "Burn Image to Disc" in the too slick looking Nero StartSmart project launcher program. edit: you might want to read Installing and configuring Nero BurnRights if you want to burn with limited user rights. The instructions that follow below should also work for burning CD ISO images with Nero Express. 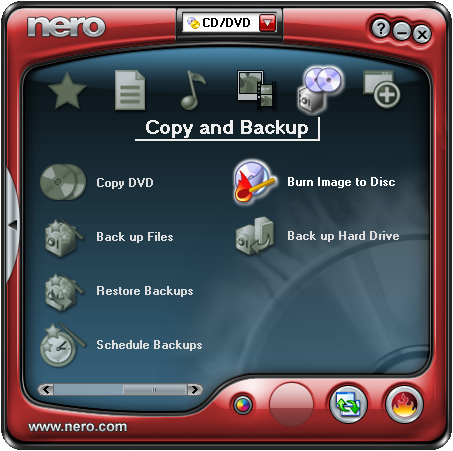 Start Nero StartSmart and hover the mouse over the icon that looks like two CDs and a safe (Copy and Backup). Next, move the mouse to the scroll bar (or slider) in the left corner of the Nero StartSmart window, and drag the slider to the right. Click on "Burn Image to Disc" in the right part of the window. Nero StartSmart: Burn Image to Disc. Nero Express should be started via the StartSmart project launcher, and open a file browser so you can select the DVD ISO image you want to burn. The next steps are explained below. Nero Express: What would you like to burn? If you prefer not to use the Nero StartSmart project launcher, start Nero Express for example via the start menu. Since I got Nero express with the BenQ DW1650 I installed in my Compaq Pressario, Nero Express on my computer is located in the "Nero OEM" sub group of "Nero" in the "All Programs" menu of the Start menu and so might your version of Nero Express. Nero Express 6: What would you like to burn? Select "Disc Image or Saved Project" from the menu displayed under the text "What would you like to burn?". An "Open" dialogue window (file browser) should appear on top of the Nero Express window. 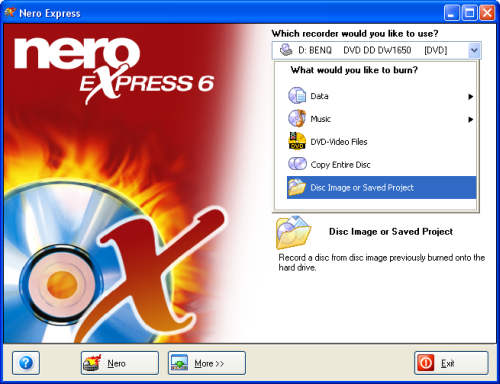 Nero Express file browser, DVD ISO image selected. Browse to the right folder, select the DVD ISO image (or CD ISO image), and click the Open button. The Image recording dialogue window should now appear. Nero Express: write a premastered image. I prefer to enable the "Verify data on disc after burning" option. It takes some extra time, but better safe then sorry, especially if you decide to delete the downloaded DVD ISO image after burning. Nero Express: verifying the compilation. Clicking on the Next button should start the DVD burning process. If you forgot to insert a recordable DVD the program will ask you to place on into the DVD burner. I used a Imation DVD+R 8x 4.7 GB DVD (made in India, reorder no. 51122 17233). I have no idea of how good (or bad) those DVDs are but the only one that failed on me was the first DVD I burned with the BenQ DW1650. Maybe because the DVD burner had to learn the right parameters to burn this type of DVD optimally. What about the SuperGamer 2 DVD? When the DVD was done, I rebooted the computer with the SuperGamer 2 DVD back in the drive in order to boot the PC Linux OS (PCLOS) on the DVD and get access to the games and game demos on the SuperGamer disk. After quite some time KDE showed up and I was able to check some games under the 3D Games sub menu of the Amusement menu entry of the KDE start menu. I was a bit disappointed: the sound was not working, which I consider very odd because as far as I know my Compaq Pressario SR1505LA has standard on-board audio, nothing special. Moreover it took quite some time for a game demo like Quake4 or Doom III to start, which can be blamed on the DVD's speed of course. All in all I consider this a good idea. Was this article helpful to you? Want to say thank you and support this site? Please check out my my Amazon wish list. Just by spending a few dollars you can make my day, thanks! 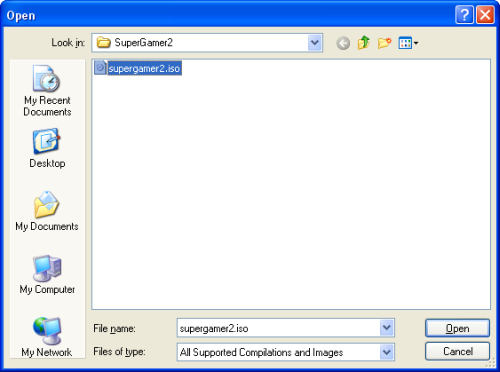 SuperGamer 2 Torrent - direct download of the .torrent file needed.